The highly-anticipated film Kalank has finally released! The multi-starrer movie directed by Abhishek Varman features Varun Dhawan, Alia Bhatt, Aditya Roy Kapur, Sonakshi Sinha, Sanjay Dutt and Madhuri Dixit Nene in the lead. 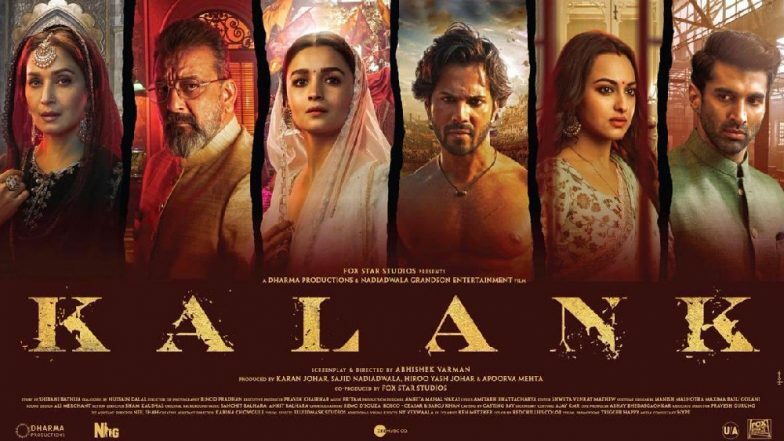 Kalank, which has released today (April 17), is expected to have heavy footfalls at the multiplexes and the reason are the two bank holidays – Mahavir Jayanti and Good Friday. So will this help to boost the box office collection of Kalank? Kalank Quick Movie Review: Alia Bhatt and Varun Dhawan's Period Love Story is Beautiful To Look At. The screen count of Kalank in India is 4000 whereas in overseas it will be released in 1300 screens. This movie has got massive screenings, making it one of the widest releases of this year. Not just that, Varun Dhawan and Alia Bhatt who have worked together before, have never had such a wide release before. And the makers have also made a wise decision by releasing the film during bank holidays. Mahavir Jayanti 2019 which is today (April 17) and Good Friday 2019 that is on April 19, both the holidays are falling in the same week. This is in fact a long-long weekend plan for most of them and why wouldn’t one make it to the theatres to watch Kalank? Box Office Prediction: Will Varun Dhawan and Alia Bhatt's HIT Jodi Ensure the Biggest Opening For Kalank? Kalank has already grabbed eyeballs for the intriguing star cast. Though the film must have appeared like a Sanjay Leela Bhansali movie to many, the cinephiles would still rush to the theatres to watch the period-drama on the big screens. Let’s see how Kalank manages to rake in some strong figures on day one. So, will you utilise your holiday to watch Kalank at your nearby cinema hall?